Don't Ignore Those End-of-Chapter Questions in Your Textbook! Recent research shows that practiced, spaced retrieval of information (from your memory) is the key to long-term, solid learning. The kind of learning you need as you progress through your next courses—and need an immediate recall of the facts and principles of anatomy and physiology. Retrieval practice can take many forms, such as flash cards or asking each other questions in a study group. Research shows that one of the most potent forms of retrieval practice is testing. 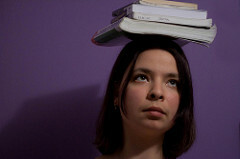 The more you repeat the testing, the stronger the brain connections (synapses) involved in remembering that particular information get. Stronger synapses mean better recall and longer-lasting recall. In other words, repeated retrieval practice gets everything into your long-term memory, so you won't forget it by the time you get to the A&P exam—or when you need it all later in your clinical courses and career. So when your professor tests or quizzes you, they do not just measure how much you know—they also strengthen your ability to "keep" all that knowledge for the long term. 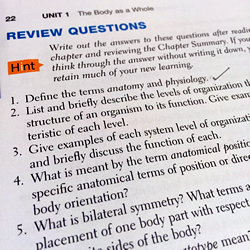 One of the easiest ways to put retrieval practice into your study routine is to answer the chapter questions in your textbook. I know that unless the prof assigns them as graded homework, most students just skip those textbook questions. Too bad, because they are one of the best ways to learn! Researchers who study learning have clearly shown that rereading your chapter over and over doesn't do a thing to reinforce your learning. Of course, you have to read the chapter at least once, but testing yourself on the material works way better than rereading the chapter—or your notes—again and again. Instead of ignoring those review questions at the end of the chapter, write out the answers to them. Then check your answers, using the chapter content or the answer key (often located in an appendix or the online textbook resources). Don't check each one as you answer them because it works better if you just move on to something else first, then go back later for feedback on your answers. The spacing of your retrieval practices is critical for effective learning, too. So do your self-testing for short stretches, but frequently. Every day is best if you can manage that. Don't get discouraged if you don't do very well the first couple of times. That's expected. I realize it's more fun to see immediate progress. But when it's too easy, you're not learning for the long term. You want to struggle—even forget some of it a few times—so that your brain gets a good workout. No pain, no gain. Eventually, you'll get better. With repeated practice, practice, practice of information retrieval by spaced testing, you'll be learning more deeply—and more permanently.